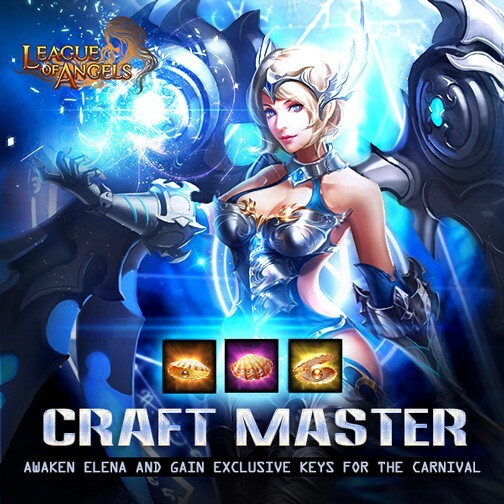 1.Awaken Elena here and gain the EXCLUSIVE keys(Normal Shell, Fine Shell and Rare Shell) for the coming carnival! 2.Spirit Essence, Little Red Fashion, Lvl. 10 Common Gem Chest, Lvl.10 Fusion Gem Chest, Golden Dragonsoul Pack(E), Munin's Power and Royal's Mark will be in Mythic Origin Crystal! Heavenly Mirror and Saint Bracelet, the powerful amulets are added in Epic Origin Crystal! 5.Lvl. 11 Valuable Gem Chest, Lvl.12 Gem Chest and more resources are waiting for you! Apart from the above, you also have a chance to dress up Imperial Celebrity, Servant's Outfit and obtain 5-star Equip Card to add stats to your heroes! 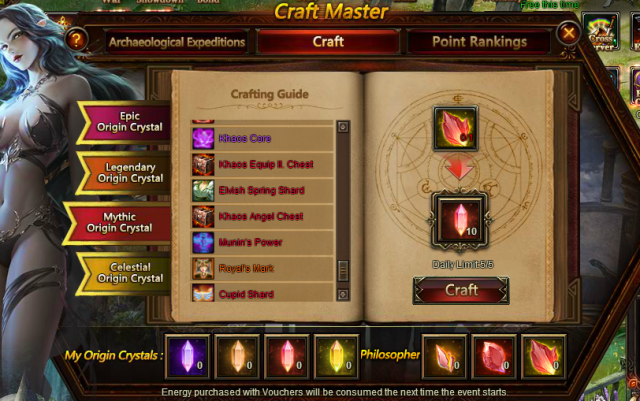 After collecting specified materials, you can craft certain items, including Khaos Core, Rare Flaming Stone, Adv. Soulstone, Lilac Stone, Mythic Divine Stone, Elena's Icon Shard, Servant's Outfit shard, Lover's Reunited, Element Crystal, Element Scroll, Magic Socketing Rod, Awakening Stone, Lvl.9 Fusion Gem Chest, Lvl. 10 Cherubstone,etc. More exciting events are coming up through April. 16 to April. 20 (Server Time), check them out in the in-game Hot Events menu now!